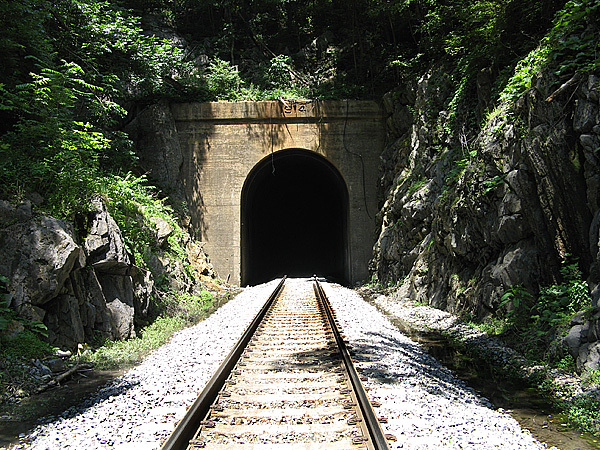 This is the last tunnel in Tennessee as the CSX heads east to North Carolina. This is Indian Ridge tunnel, in Johnson City. It’s 1.023′ long and centers at 36.345467, -82.424185. This is looking westerly. It was a sunny day, so the ballast and the ties (or “sleepers”, as they call them in the UK) overexposed a bit. Notice that the ties are concrete. And a fair number of them were badly cracked. It was hard to get to this tunnel. We had to park about a half-mile away and carefully walk down the side of a fairly busy road that had no generous shoulders. Then we had to scramble (there’s a lot of scrambling when it comes to getting to tunnels and bridges) down to the cut. The date is 1912 on the facing. Squint hard, you can see it. I have a photo of this tunnel my great grandfather made in 1914 with a large format bellows camera. you can see it @tonyblackstudio on instagram. Really interesting picture. When you figure in the relatively crude lenses then, combined with a slow, grainy film (maybe ASA 10)(ISO 10), your granddad did a fine job! There are 4 graves above this tunnel from a premature blast that killed the men. Sometimes I think every tunnel on this line has one or more graves near it. It was a dangerous business, this early railroading.